I received an email recently from one of The Walking Golfers Society members about a really cool idea – Solstice Golf. It is great to learn that some walking golfers are playing 72 a day already! throughout the summer, as all of us are educators and have some free time. AM and we plowed ahead. 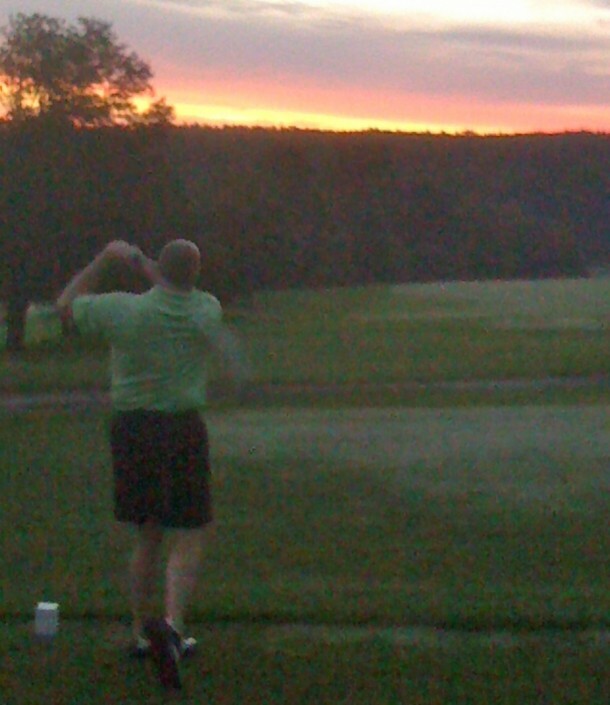 Kevin teeing it on the 1st hole at 4:45am. also played the last 27 in alternate shot format to pick it up a bit. tournament at 7:00 AM the next day (although he used a cart). Keep up the great work, I love the blog! Jeremy- What a great story….Glad to hear from someone in Western Mass… Does Southampton still offer the $19.00 walkers special? I’m from Longmeadow. Thanks…..
Wow! 72 holes in one day. You guys must be a lot younger than me. I’ve played 27 in one day, however, the muscle and joint pain is not worth it. Now, due to the fact I belong to a club (don’t pay green fees), I usually walk between 12 and 18 at one time. When playing alone on an almost empty course, nine holes is not enough. I quit when I run into slow golfers or cannot skip around. Sometimes, with leagues and busy times on the course, it is unpleasant to wait at every shot. Especially behind 4 golfers riding in carts. Cheers!